The index opened strong around 8134 but saw huge unwinding to the lows of the day around 8069 but closed flat at 8108.85, small loss of 1.75 points. The broader market though was strong with 974 advances to 589 declines. Range for the series stays at 8000-8300. 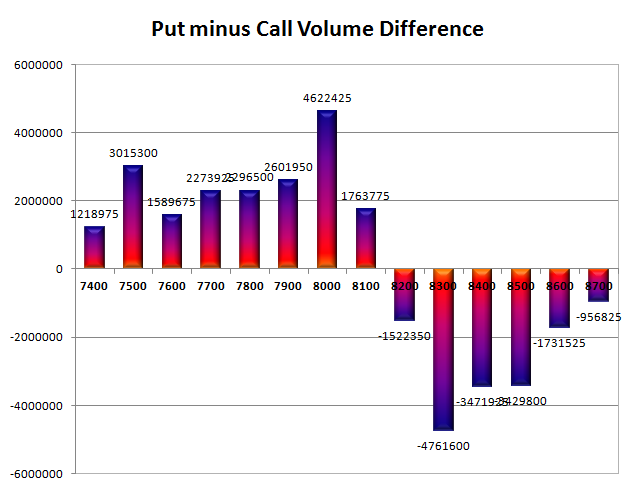 Call option 8100-8600 added 8.56 lacs OI with profit booking at 8700 and above strike prices. 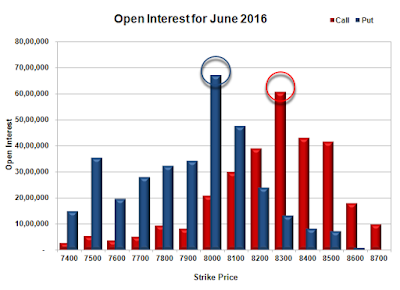 Put option 7700-7400 added 4.58 lacs OI with short covering at 8000 and above strike prices. 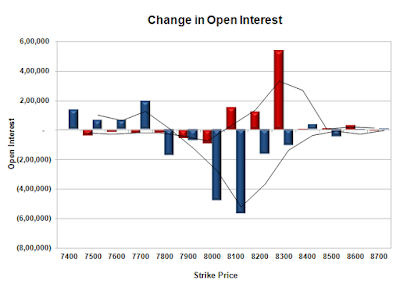 Nifty Open Interest is at 1,91,11,350 down by 16,42,725, with decrease in price, probably long liquidation. 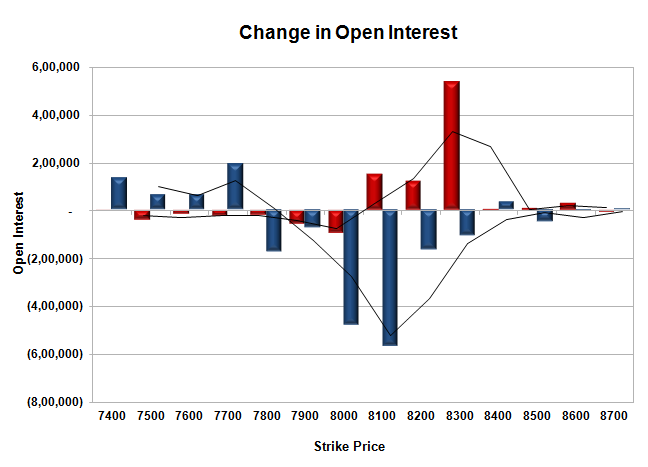 Bank Nifty Open Interest is at 15,74,250 down by 22,680 with increase in price, probably short covering. FII’s sold huge 30788 contracts of Index Futures, which includes net 31402 contracts long liquidation and 614 contracts short covering, with decrease in net OI by 32016 contracts, includes 27431 longs to 58219 shorts for the day. FII’s Index future open contract as on date is 216041 Longs to 31402 Shorts, Net 181277 down by 30788 contracts. 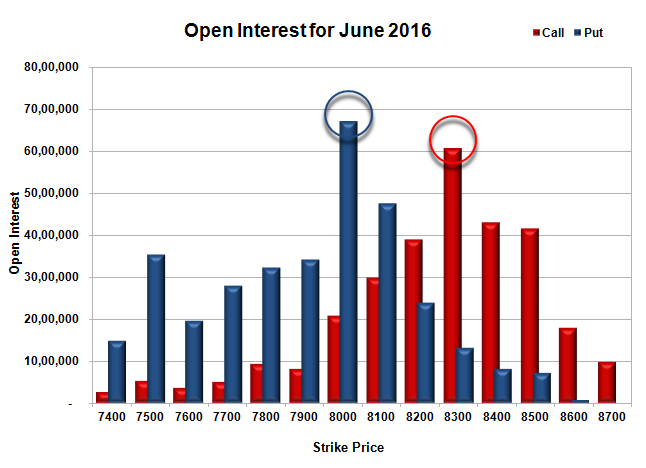 Initial support still at 8100, with OI of 47.59 lacs and below that at 8000 with highest OI of 67.04 lacs. Initial resistance at 8200, with OI of 39.08 lacs and above that at 8300 with OI of 60.74 lacs. Day Range as per Option Table is 8046 - 8168 and as per VIX is 8036 - 8182 with 8104 as the Pivot.